WASHINGTON — The partial government shutdown is inflicting far greater damage on the United States economy than previously estimated, the White House acknowledged on Tuesday, as President Trump’s economists doubled projections of how much economic growth is being lost each week the standoff with Democrats continues. Mr. Hassett, attempting to illustrate the pain caused by the shutdown, said on Tuesday that one of his furloughed staff members had begun driving for Uber to make ends meet. Mr. Hassett said it was possible that the damage could grow. He also said much of the damage should be repaired once the shutdown ends and workers get back pay. But he acknowledged that the shutdown could permanently reduce growth expectations if businesses and markets begin to expect that Congress and the president will repeat the experience again and again. Some economists have begun to warn that such a situation is likely and that economic confidence could be undermined as businesses, consumers and investors lose faith in the ability of political leaders to find agreement on issues like raising the federal debt limit and approving trade deals. If the shutdown continues through the end of March, Mr. Shepherdson said in a research note, he would expect the economy to shrink in the first quarter. While federal workers are likely to receive back pay once the furlough ends, most government contractors will not, and the longer spending is depressed, the higher the risk that the businesses they run or patronize will fail, Mr. Shepherdson said. 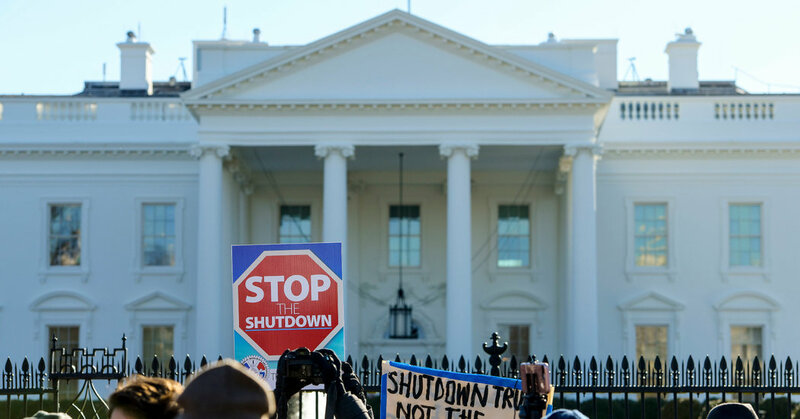 The shutdown “is threatening to derail this economic expansion,” Bernard Baumohl, the chief global economist for the Economic Outlook Group, said in a research note on Tuesday. Its effect on federal workers’ spending plans is particularly worrisome for the automotive and housing markets, which were already showing signs of trouble before the shutdown, he said. On Tuesday, a Federal Reserve Bank of New York survey showed weakening manufacturing activity in the United States, the latest in a line of similar warnings. Economists at JPMorgan Chase called the data an early indication of additional slowing in the sector, adding that the shutdown was probably hurting business sentiment. With no end in sight, federal workers appear ready to seek alternate employment before things get worse. The online jobs site Indeed analyzed job search behavior from mid-December through mid-January for workers at some affected federal agencies, including the I.R.S. and Transportation Security Administration. It found clicks on job listings rose at least 17 percent for each of those worker groups over that period, a sign that employees affected by the shutdown “are searching for jobs more right now than they usually do at this time of year,” said Martha Gimbel, Indeed’s director of economic research. That might already be happening inside the White House. Mr. Hassett said on Tuesday that a prospective new hire had told the council that he might turn down the job he had been offered out of graduate school because the government is unable to bring him onto the payroll.